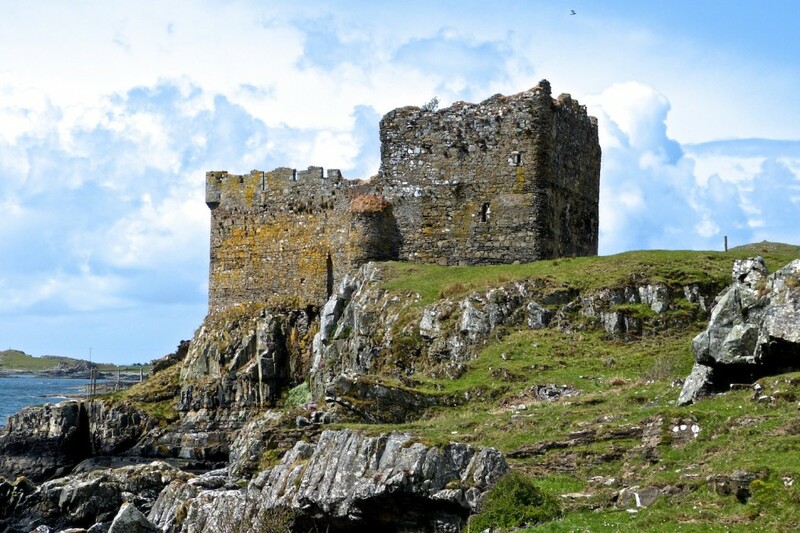 The castle which is so closely associated with Clan MacIain was described in 2013 by an eminent archaeologist as “The most intact thirteenth century castle in Scotland”. 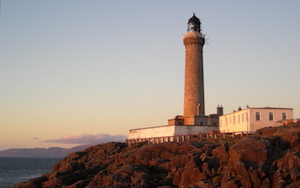 Yet Mingary’s present importance to Scottish archaeology and to the history of western Scotland rests on the neglect which it has suffered since it was abandoned 150 years ago. The ‘north range’, the main building within the castle, before work began. As a result of the steady collapse of the three buildings within the courtyard, some of the remarkably well-preserved features of the original mediaeval structure, and the way they were added to over the centuries, have been exposed. 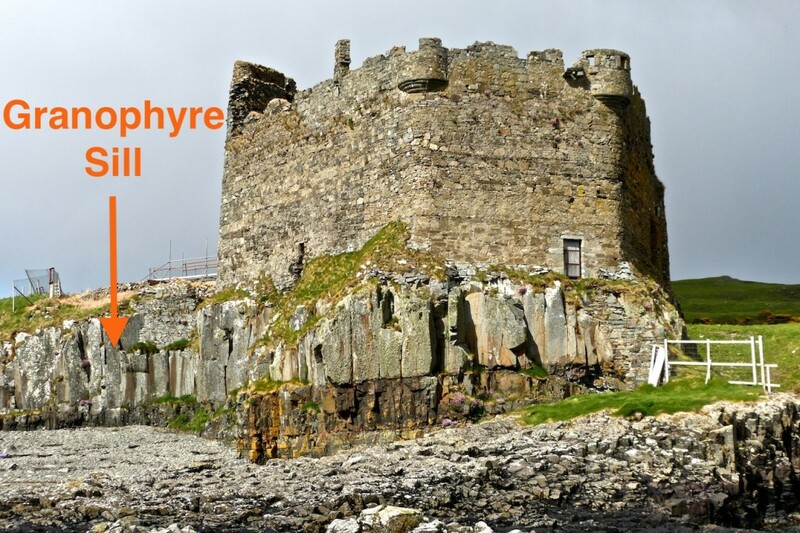 The castle was built on sill of igneous rock which formed a small headland. In the two decades before 2013, the castle structure had been in such a dangerous state of decay that access had to be prohibited. 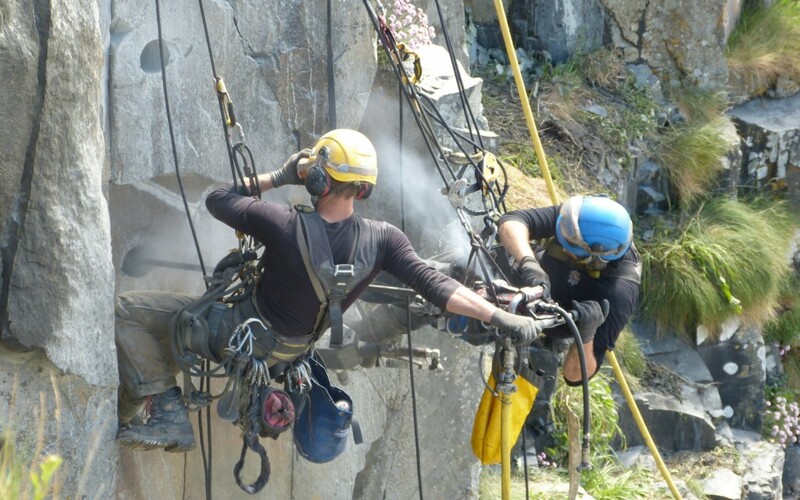 Then, in 2012, when a survey was carried out for the present owner of Ardnamurchan Estate, Donald Houston, it was found that the walls were threatened by movement of the granophyre sill on which they were built. Unless the sill could be stabilized quickly, the whole castle would collapse. 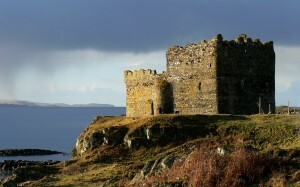 The Mingary Castle Preservation and Restoration Trust was set up to address the future of the castle. From the start, the Trust believed that, for this remote castle to survive, it had to be rebuilt so it could earn an income. This would then support a regime of continuous maintenance. To achieve this goal, Francis Shaw of Shaw & Jagger was employed to oversee the project. Francis already had the very relevant experience of saving Hellifield Peel Castle in Yorkshire; it had been in a similar state of decay, and is now a successful hotel. What Francis proposed was a £2.5 million (US$4 million) project which would satisfy the criteria set by the Trustees. 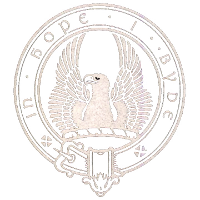 The urgency of the situation made a campaign to raise money impossible, so the Trust obtained a loan to enable work to start immediately. Holes were drilled through the granophyre so steel rods could be inserted to pin the blocks into place. Under Francis’ supervision, work started on site in April 2013, on what must be one of the most ambitious restorations of a Scottish castle in recent times. It began with a thorough survey of the structure. This continued for some months, but before it was completed engineers had already been employed to prevent what everyone involved feared – the collapse of the castle through the failure of its foundations. The granophyre sill on which it stood had, over the centuries, weathered into gigantic blocks which, like dominoes, were tilting outwards. The solution was to pin these back using steel rods – picture shows holes being drilled through the slabs, through which the steel pins were inserted. 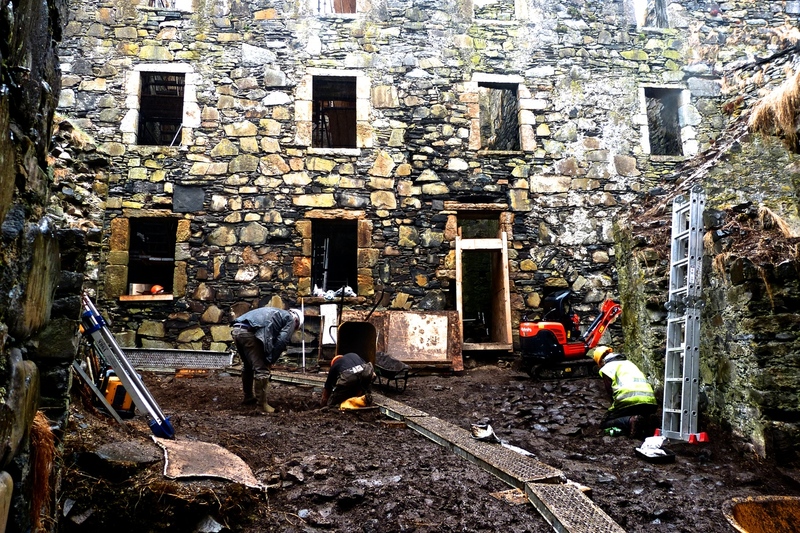 Archaeological work in progress in the castle courtyard. At the same time, teams of archaeologists from Addyman Archaeology began the process of excavating the castle and its immediate surrounds. Huge amounts of rubble had to be removed, much of it created in the early 19th century when, just prior to its abandonment, the castle was stripped of everything valuable: this included the windows, roofs, oak floors and some stonework. All materials that can be recycled back into the castle have been kept: for example the loose stone has been cleaned and will be rebuilt into the structure. 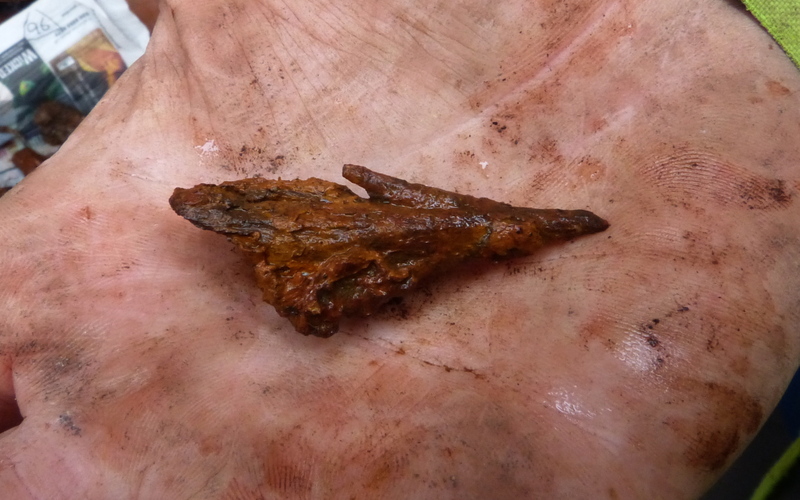 This beautifully preserved arrowhead was one of the many exciting discoveries. As archeological excavations continued through 2013, many important and exciting finds were made, some of which made national and international headlines. These included a steel arrowhead, cannon and musket balls from the wars of the Covenant, glass and ceramics from the time of Bonnie Prince Charlie, and coins from the reign of George III dated to around 1770-75. The chapel was built into the north wall and later filled in. The altar is at centre left, the twin lancet windows at right. 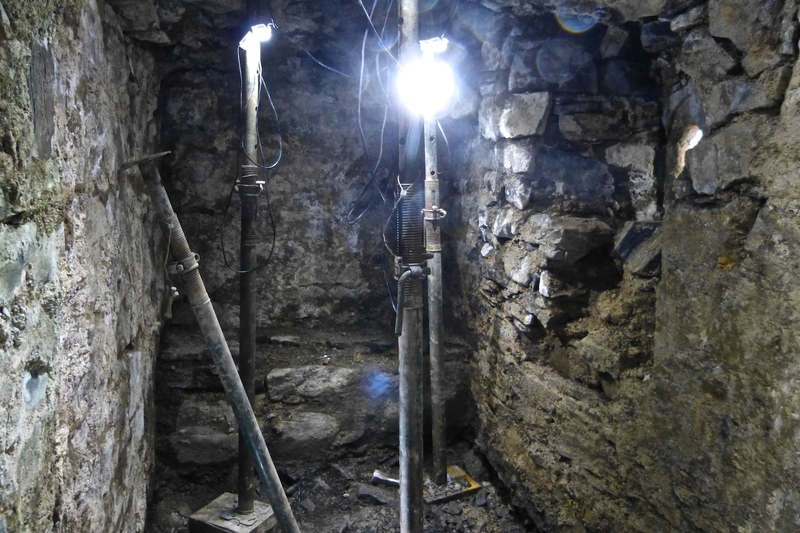 A highlight of the excavations was the opening up of a 13th century chapel which had been built in to the original north wall but later infilled with rubble. It is very likely that the chiefs of the MacIains and their close families worshipped in this room. Carved into its plastered walls was graffiti which dated back to the time the castle was built. 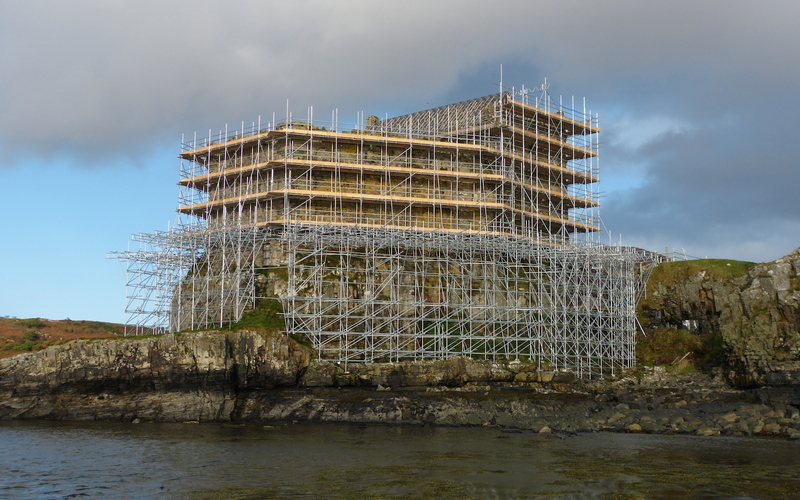 Mingary in October 2013, by which time the whole castle was covered in scaffolding. By the end of 2013 the stabilisation and investigative work had been completed, and permission obtained from officials at Historic Scotland who, because the castle is a listed building, are overseeing all the work, to rebuild the castle in the form it would have had in 1720. The plan is for the castle to become available to rent, thus fulfilling the Trustees’ determination to ensure a steady income into the future. This construction work, which included sheathing the whole castle in scaffolding to allow access to all parts of the walls, is now in progress. It is hoped that, by early 2015, the castle will once again be lived in. 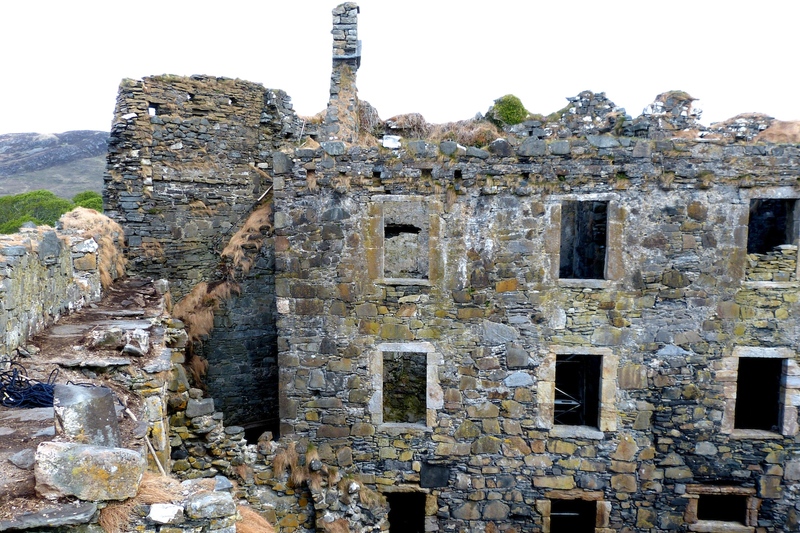 Mingary Castle has been saved, but at huge cost. An international appeal has so far raised just over £250,000 – 10% – of the projected cost. 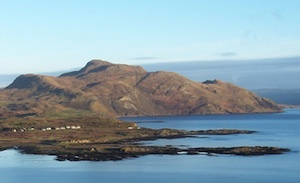 A website, at http://www.mingarycastle.com/, has been set up which, as well a blog which enables readers to follow day-to-day progress, provides access to background historical papers, and enables everyone to make a donation to this historic undertaking.